Optimists believe in good luck, pessimists in bad. But if its all a matter of perspective, does luck even exist? Tsutomu Yamaguchi was a technical draughtsman for oil tankers when in the summer of 1945 his employer Mitsubishi Heavy Industries sent him to the Japanese city of Hiroshima for a lengthy business trip. His visit ended abruptly when the B-29 bomber Enola Gay dropped the Little Boy atomic bomb on 6 August, and the equivalent of 15 kilotons of TNT exploded less than two miles away. Even though Yamaguchi was inside the instant death zone, he managed to escape with only burns, temporary blindness and ruptured eardrums. He headed back home to Nagasaki and, despite his injuries, was able to report to work on 9 August. Yamaguchis supervisor couldnt believe his wild story about a single bomb that instantly destroyed a city and, just as he was telling Yamaguchi that his tale was crazy talk, the room filled with an unearthly, solar-white light as the Fat Man bomb detonated over Nagasaki. Yamaguchi somehow survived that blast too, and lived until 2010, when he died at the ripe old age of 93. Was Yamaguchi lucky or unlucky? On the one hand, he was a simple businessman who was nuclear-bombed twice, which sounds about as unlucky as someone could possibly be. On the other hand, he was a survivor of the two deadliest bombs ever used in war, and still lived to old age, facts that make him seem wondrously lucky. Or consider another wartime tale. A rocket-propelled grenade (RPG) is a small rocket with a charge of explosives. Designed as a tank-killer, it can punch a two-inch hole through a foot of armour, and has become a handy and commonplace battlefield weapon. In 2006, Private Channing Moss got to know one in a personal way. Moss was on patrol with an Alpha Company platoon in eastern Afghanistan when their convoy started taking fire. One enemy RPG exploded a soft-skin pickup truck, another shredded the protective armour of a Humvee, and a third hit Moss, lodging in his abdomen. Although Moss was still alive, the unexploded grenade inside his body could blow at any time. In the view of one commentator, Moss was either the luckiest or unluckiest soldier in the entire US army, and no one knew for sure. The platoon commander called for emergency medical pickup, and a very nervous Blackhawk helicopter flight crew ferried Moss to the nearest medical outpost. The doctors and an explosive ordnance-disposal technician managed to remove the RPG, patch up Moss and safely detonate the weapon outside the bunker. Several surgeries later, he went back home to his family. Individuals such as Yamaguchi and Moss show up on internet lists of the worlds unluckiest people and also of the worlds luckiest people; whether they are lucky is ambiguous. Pick up any newspaper and youll find similar stories survivors of terrible plane or automobile crashes, or patients with dread diseases who live past their predicted expiration date. Invariably they are described as hugely lucky. Thats puzzling on the face of it; youd think that somebody really lucky wouldnt have got cancer or been in a terrible wreck to start with. Such cases raise interesting questions about the nature of luck. Is it something real or is it purely subjective, just a matter of how we happen to feel about the things that happen? It might be that Yamaguchi and Moss are neither lucky nor unlucky. Luck might not be a genuine quality of the world at all. Luck judgments are a matter of perspective. Whats going on in these cases isnt a matter of exposition. Its not that if the story of Yamaguchi or Moss were presented in one way, theyd look lucky, and if presented another way, theyd look unlucky. Rather, there is a clear sense in which something happened to them that had both a definitely unlucky component and a definitely lucky one. Overall, though, what should we think? Was Moss the luckiest or the unluckiest soldier in the US army? Was Yamaguchi the luckiest or the unluckiest person in the world? It turns out that there is a simple variance in personality that determines ones perspective on luck. In a forthcoming paper for the journalPhilosophical Psychology, the experimental psychologist Jennifer Johnson and I hypothesise that people who tend to be optimists would see cases such as Yamaguchis and Mosss as instances of good luck, and that those who tend to be pessimists would see them as examples of bad luck. We conducted a study to compare what optimists thought about ambiguous cases of luck with what pessimists thought about the same cases. Study participants were first given a well-known psychologicaltest the Life Orientation Test (Revised) to determine where they fell on the pessimism-optimism continuum. Then we provided them with five real-life stories of ambiguous luck, including the tales of Yamaguchi and of Moss. Finally we asked them whether Yamaguchi and the others were unlucky, somewhat unlucky, somewhat lucky, or lucky. It turned out that there was a significant positive correlation between their level of optimism and what luckiness rating they gave those scenarios. That is, the more optimistic someone was, the more likely she was to judge people in the example vignettes as lucky. Likewise, the more pessimistic someone was, the more likely she was to judge the people in the vignettes as unlucky. One of the things this means is that the more optimisticyouare, the more you thinkothersare lucky. If you are more of a pessimist, youre likelier to see others as suffering bad luck. Pretty much everyone recognised the good part in the stories of Yamaguchi and of Moss their survival as being lucky, and the bad part their being bombed as unlucky. Optimists and pessimists can clearly agree upon what constitutes good versus bad luck. However, optimists and pessimists varied in their judgments of the severity of the bad-luck components. The more pessimistic the person, themoreunlucky she considered the bad-luck component. The more optimistic the person, thelessunlucky she considered the bad-luck component. In other words, if youre an optimist, you just dont see the cruel or miserable parts of life as being all that terrible. When Moss had an RPG embedded in his abdomen, that was unlucky. When he survived the whole ordeal, that was lucky. However, for optimists, getting impaled with an RPG was not allthatbad, so it made the getting-impaled-and-surviving event a luckier one than the pessimists believed. For pessimists, his getting skewered with an RPG was so unlucky that it diminished the good fortune of his survival. Would you accept a gamble that offers a 10 per cent chance to win $95 and a 90 per cent chance to lose $5? Would you pay $5 to participate in a lottery that offers a 10 per cent chance to win $100 and a 90 per cent chance to win nothing? Far more people are ready to say yes to the second question than to the first one, despite the fact that the two cases are identical you have to decide whether to accept an uncertain prospect that will leave you richer by $95 or poorer by $5. Furthermore, the odds are the same both times. Why? Well, the second version talks only about winning, never about losing anything. Pay $5 to have a 10 per cent chance at winning $100? Sure, that sounds good. But accepting a gamble with a 90 per cent of losing $5? No way. The one-month survival rate is 90 per cent. There is 10 per cent mortality in the first month. Surgery was much more popular when the outcomes were presented in terms of survival (84 per cent of physicians preferred it) than when framed latterly as mortality rates (in which case 50 per cent favoured radiation). Here is the exact same scenario, evaluated by medical professionals, and yet they give very different recommendations based solely on the wording. Brains really dislike bad news. Anything presented negatively in terms of mortality, loss or death is automatically seen as a risk that must be avoided. Conversely, good news is always welcomed. Our subconscious intuitions are happy to sign on for actions when they are sold as winning survival and success; it doesnt matter if the positive and negative versions are extensionally equivalent or not. The scenarios on the left and right are exactly the same; they are merely delivered in psychologically different packaging. Even though that packaging varies only slightly, when these vignettes were given to a group of test subjects, they reacted very differently to the two variants as a result. Study participants read each vignette and then decided how lucky the subject of the story was. For example, in the first one, participants were provided with the prompt Tara Cooper was:unlucky,somewhat unlucky,somewhat lucky,lucky.Circle one. There were similar instructions for the winter storm, and other examples. The positive and negative frames were scrambled so that everyone got some of each, but no one participant read both a positive and a negative version of the same case. The results were striking. When Tara Cooperhit fiveout of six numbers in the lottery, practically everyone thought she was lucky to do so. But when shemissed oneout of six numbers in the lottery, that was universally judged to be bad luck, even though, of course, it was the identical event. The same pattern held for the other vignettes we provided. Two ways of describing equivalent things produced extremely different opinions about luck. Overall, when events were presented positively, participants considered the event lucky 83 per cent of the time. The very same events when cast negatively were considered lucky only 29 per cent of the time. The statistical p-value was < .001. Manipulating the words describing an event manipulates how people react to those events and whether they see them as lucky or unlucky. If luck is real, a genuine property of persons or events, then there must be an objective fact as to whether Yamaguchi and Moss were truly lucky. Sure, the optimists say that, taken all in, they were lucky, whereas the pessimists insist that they were unlucky. But which is it? Who is right? 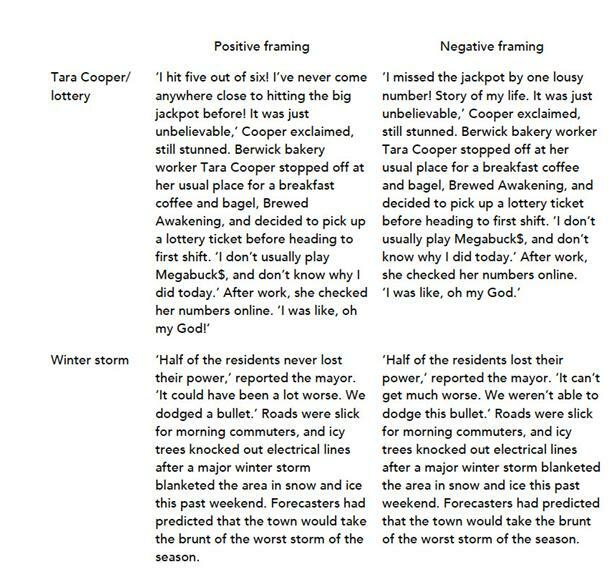 Likewise, we need a justifiable verdict about Tara Cooper and the residents of the winter-storm town; setting framing aside, are they in fact lucky or not? This is the point where a theory of luck should ride to the rescue. When we have perplexing experiences or inconsistent perceptions, thats exactly when we want a theoretical explanation to sort everything out and set the world aright. A kayak paddle half in the water looks bent, and out of the water it does not. Parallel train tracks disappearing into the distance appear to converge. A decent theory should (1) tell us that, in fact, the paddle is not really bent and that the tracks do not truly converge, and (2) explain away the competing perceptions. A theory of optics that couldnt do those things would be rejected as inadequate for that very reason. Generally, when people think about luck (good or bad), they think of improbable events that have some kind of significance or impact. So winning the lottery is a matter of luck, but losing the lottery is not winning was very improbable and losing was very probable. Or luck is thought to be a matter of whats outside of our control, in which case both winning and losing the lottery are due to luck, since neither outcome was within anyones control. Unfortunately, neither conception of luck is any help at all with the cases at hand. The improbability and control ideas might distinguish between luck and non-luck, but tell us nothing about good luck vs bad. They are unable to show whether Yamaguchi and Moss were overall lucky or overall unlucky, and explain why the competing intuition is mistaken. Likewise in the framing cases, neither understanding of luck (improbability or lack of control) can tell us which frame prompts the truth and which obscures it. What all this shows is that our judgments about luck are inconsistent and changeable, the predictable result of framing effects and idiosyncratic personality traits. They raise the serious possibility that luck is no more than a subjective point of view taken on certain events, not a genuine property in the world that we discover. It might well be that attributing luck is a merefaon de parler, or turn of phrase, and not something we should take seriously an outcome that would come as a real surprise to gamblers, athletes, job seekers and stockbrokers, all of whom see their histories as saturated with luck. Their luck might well be, in a very strict psychological sense, entirely of their own making.